The Lion is said to be the king of the jungle. The Tiger is the largest feline and the Lion is second. It is also one that is very distinguished. With their wild manes that get larger as they get older they are easily identifiable. Of course the mane is only on the males. 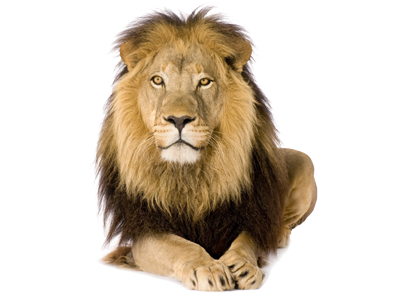 The Lion is a very social animal and that is a unique characteristic that sets it apart from other felines. They will live together and they will hunt together. One adult male is the leader. The rest are females and the young cubs that make up the pride. When the young males are old enough to start mating they will be forced out of the group. Then they will go and form their own pride in their own territory. The female lions take care of almost all of the hunting. This is why it can be very difficult for a male to go out on his own. He may have to take on challenging another male in order to take over a pride that already exists. By doing so he does much more than assume a leadership role. He is also securing his own survival because it can be very hard for a male Lion to do all of his own hunting. There are many different types of food that the Lion will consume. They are skilled hunters with a strategy in place that can’t be beat. They will ambush their prey from all directions and close in for the kill. They will also eat the remains of other kills that may have been left behind from various animals. There have been instances of the Lion attacking and consuming humans that they come into contact with. Some experts believe that it is possible for a Lion to get a desire for human meat after doing so. That can make such felines very dangerous when there are villages around where they reside. The Lion isn’t active very much at all, with resting consuming up to 20 hours a day. They spend the rest of their time eating, walking, grooming, and socializing. They rest more than any other type of feline. Each member of the Lion pride has a role that is very important. Some of them are hunters and others are caregivers. Some of them work to protect the entire pride and there are those that scout out the environment watching for predators. They are very social animals and often seen being affectionate with each other. They use many vocalizations to communicate with each other. The one that is most commonly associated with them is the ferocious roar. They also growl, purr, and mew at each other. The intensity of such sounds can indicate fear, anger, offer warnings, and even offer encouragement for mating. There aren’t very many Lions left living in the wild. Studies show that their populations have declined as much as 50% in the past 20 years. Is their reign as king of the jungle going to come to an end? Right now they are classified as being vulnerable. Only time will tell if they are going to be able to continue surviving. A lack of natural habitat, a genetic pool that is very close to each other, and slow rates of reproduction are all issues that conservation groups continue to focus on.